The Forest River Rockwood Windjammer travel trailer is a spacious travel trailer that provides you with everything needed to feel comfortable and at home while you travel. The unique "V" shaped nose front provides more storage and living space and lends to the aerodynamic design of this travel trailer. As a result you'll experience better fuel economy and less drag when traveling with in this RV. The exterior is constructed from a fully laminated aluminum frame and a radius roof with vaulted ceilings. A power awning with an electric rain dump means you can enjoy watching the rain, without getting wet or worrying about stressing your awning. If you're they type of RVer who is concerned with the interior accommodations of your RV, you won't be disappointed with the Windjammer. Solid wood and raised panel doors and drawers lend to the homey feeling of the interior. The kitchen includes a microwave, a 22" gas stove, and a residential one piece sink. Each feature of the Windjammer travel trailer is intended to keep you comfortable, regardless of where you are. Contact us at the top RV dealer in TX to learn more about the Windjammer travel trailer and find a floorplan you'll love. Our team has the expertise necessary to help you make the best decision for your family so you can hit the open road and start enjoying the freedom RVing offers. You can also check out some of our other products, including our fifth wheels, travel trailers, toy haulers, and more! 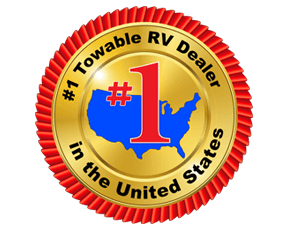 Use our RV search to search through our entire inventory and to learn more.